A healthy chipmunk will be lively with a shiny coat, bright eyes and no signs of diarrhoea around its tail. Everyday, all around the world, animals are brutally ABUSED, MURDERED and SLAUGHTERED for the pleasure of humans. Ever wondered what YOU can do about it? Here’s one thing YOU can do… the power really is in YOUR hands! Print out this beautiful high resolution Tara image for your altar at no cost! When you print out the image, you are making a COMMITMENT to complete 1000 recitations of Green Tara’s mantra “OM TARE TUTTARE TURE SOHA“. While reciting focus on generating merits for all animals to take a good rebirth, and to stop animal cruelty. DEDICATE IT to the dancing bears of India, to the dolphins stabbed in Japan. DEDICATE IT to the suffering dogs in the farms of Korea, to the bulls of Spain. DEDICATE IT to abused working horses, and to the chickens in battery farms all over the world. Think of all the animals in the world who suffer every single day because of human selfishness… dedicate it because YOU CARE. Here’s another thing YOU can do – print out the image and pass it to your friends! Get creative! Frame it, wrap it, laminate it for them! Give it to them as a birthday gift! Give it to them as a surprise! AND ASK THEM TO RECITE 1000 Green Tara mantras too! Give it to them because you know they too can help reduce animal cruelty around the world. Do something about animal cruelty NOW. 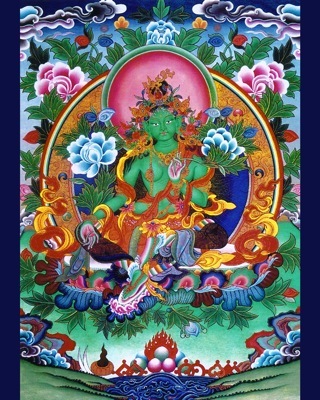 I love the green Tara and I love this idea! This will be my favourite practice, and I will complete it happily. i m impressed wit your wrintings, it help us to improve r life, each and every sentence has a meaning, thank you so much for sharing and caring for sentient beings….take care rinpoche…..